The postwar Healing Revival gave birth to many ministries. Revivalists by the hundreds were holding meetings throughout the United States for up to several weeks at a time. 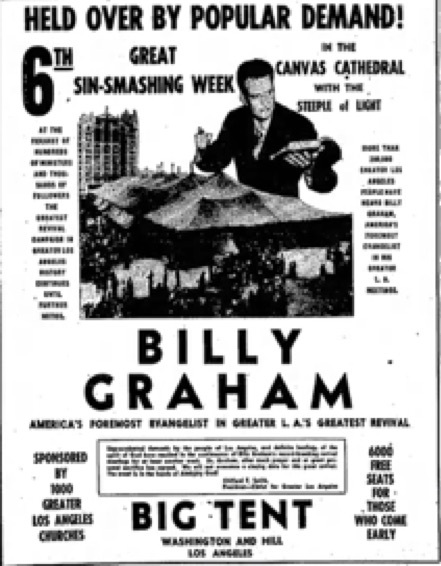 Religious superstars such as Billy Graham and Oral Roberts filled tents with thousands of people in major cities, yet they were just two of many evangelists rising to overnight fame. Scattered throughout the nation were countless others just as intent on creating ministries of their own, as they uplifted spirits with religious entertainment, healing, and prayer. It was not uncommon for local vendors to setup hot dog stands on the grounds outside a tent ministry or for traveling musicians to join the revival with concerts as families joined together in unity. The revival meetings were not simply gatherings to hear the Gospel preached; they were a place of community that made even the least recognized speaker attract a crowd. The passage of time serves to obscure the scenes depicting the thrill of a revival for Americans in the 1950s, it becomes more difficult to relate to the experience. Today’s typical cinema portrayal of children sitting bored in a church service with an overzealous mother and disinterested father has made thoughts of excessively long services seem cold and uninviting, but for the typical family of the era, it was an exciting and enjoyable affair. For those attending, revivalists were the heroes of their day fighting unseen supernatural villains lurking in the darkness. Listed as “Jimmie Jones.” 1940, Feb 15. Prayer Meeting. Palladium-Item. It is very difficult to understand the infamous leader of Peoples Temple amid all this splendor, but in the early days of his ministerial career, Jim Jones was one of their “heroes.” Although he was a “Full Gospel” preacher and evangelist, keeping the roads hot throughout Indiana, Ohio, and other surrounding states, Jones might have gotten lost among the hundreds of other Pentecostal evangelists, and folks may have mistakenly assumed that he was just another “Pentecostal Preacher.” Even those in the poor section of Indianapolis who noticed the title “Full Gospel” used in advertisements for his church at 1506 North New Jersey Street would have assumed Jones was affiliated with the other Pentecostal churches of Indianapolis, and that his interdenominational stance was just another gimmick to attract converts to mainstream Pentecostalism. But is this assessment accurate? As a child in Lynn, Indiana, Jones was introduced to Pentecostalism through the Reverends Robert and Lester McFarland of the Apostolic Gospel Church, a father-and-son team of United Pentecostal Church (UPC) preachers and church planters. Jones first witnessed the Pentecostal healing experience in Pentecostal revival meetings in Lynn, and though Jones started his ministerial career in Indianapolis as a Methodist, history has linked his “Peoples Temple Full Gospel” to his youthful experience with the UPC or the Church of the Nazarene. This misconception is likely due to the fact that Jones was ordained into the Independent Assemblies of God (IAoG) in February 1956, and the Assemblies of God are often considered to be part of mainstream Pentecostalism. The IAoG, however, was separate from the Assemblies of God. Jones was a preacher and evangelist in the “Latter Rain” movement, a sect of Pentecostalism rejected by both the Assemblies of God and the UPC and vastly different from the Church of the Nazarene Jones once attended. Jones was not a minister in a well-established Pentecostal denomination; he was a member of a new branch of Pentecostalism that spread quickly after another Indiana evangelist, William Branham, held a series of “faith healing” meetings across Canada in the late 1940s. Rev. 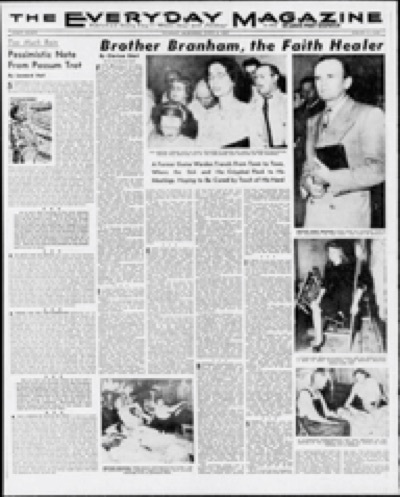 William Branham of Jeffersonville, Indiana rose to overnight fame after a revival meeting in Vandalia, Illinois attracted the attention of national news media. Thousands of people packed the small town of 5800 to see the “healer,” and reporters eager to capture a “miracle” watched as Branham “diagnosed” diseases with “vibrations” of his hand and “cured” them by commanding their “demon” to depart. News of those who had accepted their “gradual” healings spread much more quickly than news of those whose cures had failed, and as the Branham campaign moved into Saskatchewan, Canada, a group of students at the Sharon Orphanage and School were convinced that Branham’s “gift” was an example of the manifestation of the Holy Spirit predicted to visit the Christian Church just before the End of Days. Branham’s unusual theology and stage theatrics were a catalyst for the massive revival that followed. Pentecostalism had been in strong decline due to the diminishing “supernatural” occurrences during services and revivals. The students at the Sharon Orphanage and School had been spending countless hours in fasting and intercessory prayer for God to empower the Church before the world powers clashed in the final war of Armageddon. They had been reviewing Reverend Franklin Hall’s doctrines on “atomic power” through “fasting and prayer” and were convinced that Branham’s performance was the real-life display of that “atomic” power. Many began claiming fulfillment of a prophecy in Chapter 2 of Joel in the Christian Bible, comparing the original Pentecostal Revival at Azusa Street in 1906 with Joel’s “former rain,” while the recent occurrences of “supernatural gifts” were the “latter rain.” The “Latter Rain Revival” was born and would soon give birth to the New Order of Latter Rain movement that eventually would place the label “Full Gospel” on the Peoples Temple advertisements. 1. The overemphasis relative to imparting, identifying, bestowing or confirming the gifts by the laying on of hands and prophecy. 5. The extreme and unscriptural practice of imparting or imposing personal leadings by the means of gifts of utterance. 6. Such other wrestings and distortions of Scripture interpretations which are in opposition to teachings and practices generally accepted among us. This resolution gave birth to the Independent Assemblies of God and, eventually, the extreme sect of Pentecostalism that Jones participated in during the years leading up to the Peoples Temple migration to Northern California. After the resolution was printed in the Pentecostal Evangel publication, many prominent leaders in the Assemblies of God revolted. Of those who objected to the resolution were Rev. A. W. Rasmussen, one of the hosts of the Latter Rain Revival, and Rev. Joseph Mattsson-Boze, who had assumed leadership of the Philadelphia Church in Chicago, Illinois. Rasmussen decided that the current revival for the “Latter Rain” movement was the “present movement of God, as God’s deliverance promised in the Bible.” When the Assemblies of God rejected the movement, Rasmussen organized under the name “Independent Assemblies of God,” and the two ministers heavily promoted Rev. William Branham through joint “healing campaigns” and Mattsson-Boze’s Herald of Faith publication. It should come as no surprise that it is within the six points of the Assemblies of God resolution that Jones’ ministry would differ from the Pentecostalism of his youth, or that William Branham would be one of Jones’ early mentors in the extremist sect of Christianity that served to create the leader of Jonestown. After Jones was ordained into the Independent Assemblies of God by Joseph Mattsson-Boze and began preaching William Branham’s “Message” theology, he and Mattsson-Boze held joint meetings at Faith Temple just outside of Hagerstown, Maryland. Mattsson-Boze’s recognition in the New Order of Latter Rain movement and his connections to Branham opened the door for many other speaking engagements for Jones, one of which lifted him into power as a “prophet.” At a Columbus, Indiana “Latter Rain” convention, a little old white-haired lady introduced Jones to the congregation with a prophecy: “I perceive that you are a prophet that shall go around the world.” In New Order of Latter Rain theology, this action lifted Jones into power as a “prophet.” There were no prerequisite actions for this “gift” – such as learning sound theology, mental or psychological evaluations, displaying healthy leadership skills, or even background checks – but it did instantly designate Jim Jones as a prominent leader in a new sect of Christianity. Even with the movement’s “imparting of the gift” to Jones, however, history would not record Jones as a “Latter Rain” minister during his Pentecostal years. Jones’ ministry was more closely aligned with a sub-sect being created within the movement. A good indicator that a false doctrine in the church is underway is when a teaching projects that man can be big and powerful while God can be manipulated and made subject to man’s plans and schemes. It should come as no surprise that after Branham began to mentor Jones, elements of the “Manifested Sons of God” doctrine began to enter Jones’ ministry. Like Branham, Jones promoted himself as a prophet-leader, and his converts believed that he was the return of Elijah, the Old Testament prophet. Both taught a theology that suggested God Himself was being made manifest in either their ministries, their spoken word, or their person, and converts regarded them both as ultimate authority in doctrine and Scripture. The “Manifested Sons of God” theology enabled the ministers to become a “Voice of God” to their converts, which would have been harshly condemned in the Pentecostalism of Jones’ youth. While Jones may have brought existing or potential Pentecostal converts in the door using advertisements of “Full Gospel,” that phrase was heavily overloaded with extremist views not part of mainstream Christianity. In 1956, some of these views were popular among Latter Rain Pentecostals, however, and Jones organized a huge “Brotherhood-Healing Crusade” at the Cadle Tabernacle in Indianapolis. 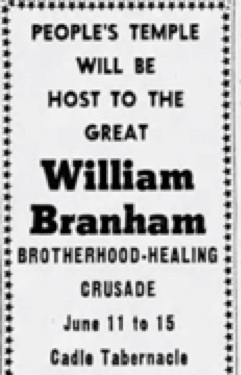 Peoples Temple was host to William Branham at a time when Branham was well-received among those participating in the Healing Revival. Also involved were other big names in the Revival, such as Latter Rain leaders Joseph Mattsson-Boze and A. W. Rasmussen; Dr. David Du Plessis, head of the World Pentecostal Fellowship; and more. Evidence suggests that Jones was aligned with the “Message” as the “Full Gospel,” but was not in agreement with the business side of the movement. Jones described a disagreement between himself and Branham over theological points that generated less revenue. Though Jones does not specifically describe which topics Branham warned him to avoid, it is safe to assume many of Jones’ statements supporting equality and civil rights would have been unpopular in Indiana at the time. 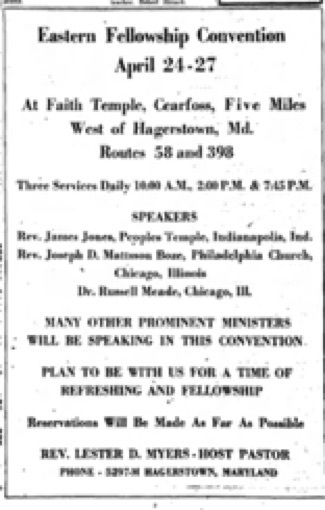 In June 1957, Jones held his second yearly convention at the Cadle Tabernacle. Peoples Temple hosted William Branham, Tommy L. Osborne, Tommy Hicks, F. F. Bosworth, and other big names in the Revival. This would also be his last Latter Rain convention, further confirming his disagreement with the business side of the movement. After 1957, Jones became disenchanted with Branham’s movement and began seeking an alternative that better aligned with his mission towards equality. There were core ideologies of the “Message” that he retained, especially those that empowered him as the “Elijah” prophet-leader of the group. There were also parts of the theology that he rejected which in many traditional “Full Gospel” settings would have alienated him from his audience. When Jones encountered the Peace Mission movement founded by Father Divine in 1959, it would have seemed as though favoring specific ideological views was acceptable. Father Divine taught that all “true” religions teach the same basic truths, and when combined with equality with regards to race, religion, and color, all humans could be spiritual “brothers” and “sisters.” Though Peoples Temple transitioned into a Disciples of Christ church between 1961 and 1965, Father Divine’s position would have resonated with Jones and seemed to be more aligned with his goals. In fact, it was ultimately this theological stance that set up the situation leading to Peoples Temple migrating to California, bringing a full separation between the “Full Gospel” Peoples Temple and the group that would be forever remembered as a suicide cult. According to Jones, men and women, refusing to identify themselves, started telephoning his home both night and day. 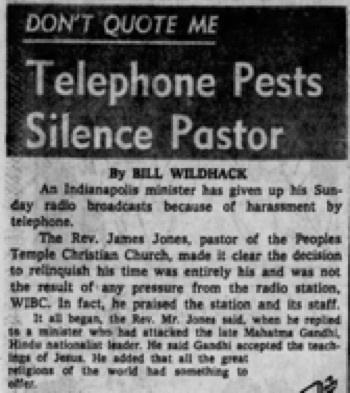 Many callers were speaking to his children, asking them, “Did you know your father is an anti-Christ, a devil?” Others called and harassed the radio station, finally forcing Jones to halt all broadcasts. Only three months later, Peoples Temple left Indianapolis for Ukiah. History remembers Rev. Jim Jones of Peoples Temple as a charismatic, Pentecostal preacher who left mainstream Christianity to create one of the most tragic religious events in modern history, and at first glance, that might seem accurate. It isn’t until one digs deep into the details surrounding the religious sects that influenced Jones, the differences that separated them from mainstream Christian denominations, and the extremist theologies they promoted, that the true complexity of Jones’ Pentecostal years is exposed. Like Jones, many of the men who mentored or influenced the leader of Peoples Temple had strayed far from their traditional roots into theological beliefs that were strongly denounced by the denominations of faith they branched away from. Yet they hold the key to unlocking the mysteries behind the creation of Jones, the choices he made, and the ability to persuade others to take their lives. The words “Full Gospel” that were once positioned beneath “Peoples Temple” are more than just a title. They tell a story, one that has been lost to time. Peoples Temple Full Gospel is a time capsule containing the mainstream Pentecostal history and background, Healing Revival, Latter Rain sect, “Message” sect, business operation, and ultimately the creation of the Rev. Jim Jones and Peoples Temple. “Pentecostalism thrived on revivals and spawned hundreds of revivalist preachers.” Griffith, R. Marie. 1997. God’s Daughters: Evangelical Women and the Power of Submission. P29. Clouse, Mary Jo. 2001. Getting Free. Example: 1947, Jun 29. Avak – The New Prophet of Healing. St. Louis Dispatch. Example: Peoples Temple Full Gospel. 1957, Dec 28. Indianapolis Star. Reiterman, Tim. 2008. Raven: The Untold Story of the Rev. Jim Jones and His People. Penguin. Reiterman has the church in Lynn listed as the “Gospel Tabernacle”; however, it was actually listed in the newspapers as the Apostolic Gospel Church. Ex: 1942, Jan 6. Lynn Gospel Church Conducts Revival. Palladium-Item. 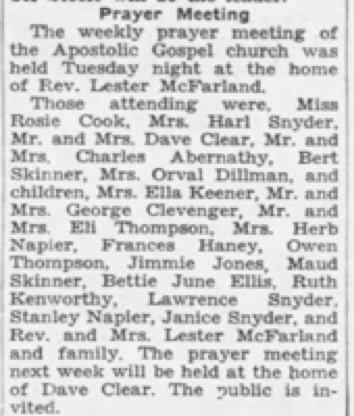 This was likely confused due to the fact that the younger McFarland opened a second church in Richmond named the “Richmond Gospel Tabernacle.” Ex: 1943, Aug 8. Rev. Robert McFarland. Palladium-Item. Order of the Faith 2002 Inductees: Robert McFarland. Jim Jones Biography: Religious Cult Leader Responsible for Mass Suicide. Accessed July 30, 2018. Ordination Certificate of Jim Jones into Independent Assemblies of God. Accessed July 30, 2018. 1947, Jun 28. Thousands Attend Vandalia ‘Faith Healing’ Services. Decatur Herald. 1947, Jun 6. Brother Branham, the Faith Healer. St. Louis Dispatch. Randi, James. 1987. The Faith Healers. See also, Pohl, Alfred. THE EXCESSES AND DECEPTIVE PRACTICES CONDONED IN DIVINE HEALING CAMPAIGNS. Bowman, Robert M. The Word-Faith Controversy. Wanagas, Ewald A. (2000). The Revival & Outpouring of the Holy Spirit: Things I Have Seen and Heard, North Battleford: Sharon Children’s Homes and Schools. Hall, Franklin. 1952. Atomic Power with God Through Fasting and Prayer. Example: 1960, Jan 23. Peoples Temple Full Gospel. Indianapolis News. 1949, September. Minutes and Constitution with Bylaws, Revised. 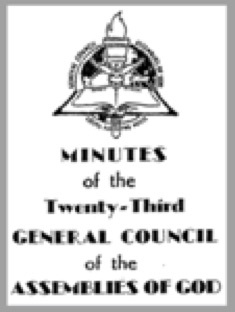 23rdGeneral Council of the Assemblies of God. The History of the Independent Assemblies of God. Accessed July 31, 2018. Ordination Certificate of Jim Jones into Independent Assemblies of God. Accessed July 13, 2018. IAOGI. Accessed 2017, May 30. Rev. Joseph D. Mattsson-Boze. 1989, Jan 25. Chicago Tribune. Latter Rain Pentecostals. Accessed Aug 16, 2018. Example: William Branham in India. 1955. Herald of Faith. Hall, John R. 2017. Gone from the Promised Land. 1956, April 21. Eastern Fellowship Convention April 24-27. The Daily Mail. Papers of Joseph Mattsson-Boze, 1932-1988. Scotland, Nigel. 2012. Christianity Outside the Box: Learning from Those Who Rocked the Boat. See also, Oakland, Roger. 1995. New Wine or Old Deception. “So it was with one of Jim Jones’s early mentors, William Branham, whose followers believed him the Second Coming.” Hall, John R. 2017. Gone from the Promised Land. P292. Example: Q1023 Transcript. Accessed 2017, May 30. Peoples Temple. 1956, June 2. Indianapolis News. Example use of “the Message”: Handwritten Notes of Jim Jones: Note to Earl Jackson. Accessed July 31, 2018. “They told me you was a prophet. I didn’t believe it, till now. Now I know you are.” He said, “That’s it! That’s the Message. That’s the thing that will shake the Kingdom of God.” Branham, William. 1960, April 17. “Go, Tell.” Accessed Aug 16, 2018 from http://table.branham.org. Mattsson-Boze, Joseph. Letter from Joseph Mattsson-Boze. Accessed August 16, 2018. Full Gospel Businessmen’s Fellowship International. Accessed August 16, 2018. Peoples Temple. 1957, Jun 1. Indianapolis News. Lady calls Jones “Elijah.” Q1023 Transcript. Accessed 2017, May 30. 100 Events in History of Peoples Temple. Accessed Aug 16, 2018. Father Divine. Accessed Aug 16, 2018. Ordination Services of Jim Jones into Disciples of Christ. Accessed Aug 16, 2018. Originally posted on September 27th, 2018. Last modified on November 24th, 2018.